All the patients who are suffering with bulging disc treat herniated disc to be as sister of it. Herniated disc is actually more popular than bulging disc where in your disc gets gapped leading to pain during bending etc activities. Herniated disc is commonly diagnosed after a patient complains of back pain, leg pain, or general weakness in the lower half of the body. When the material that sits between the vertebrae in your spine is pushed out of its normal position, it presses up against the nerves which site extremely close to your vertebrae. The shifting of the material between your vertebrae would not normally cause a problem itself, its the pressing up against the nerve endings that causes the pain. 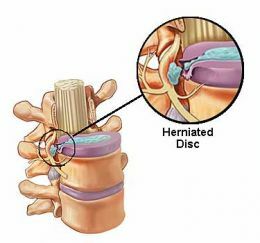 What Types Of Natural Treatment Options Are Available For Herniated Disc? Rest – As with all injuries or body aggravations, the first thing you should do is rest and avoid doing anything that aggravates your symptoms. It’s likely the disc herniation will resolve itself if given enough time and rest. Ice/Heat – You can also apply ice or heat therapy to the affected area which will help relieve any pain you may be experiencing. This works by relaxing your muscles which will reduce pain and swelling. While physical therapy can’t directly help a herniated disc it can help to strengthen the muscles in the area. This would reduce the load being placed onto the discs in your vertebrae. Stronger muscles would also decrease the chance of an injury to your spine. Medications – Anti-inflammatory medications such as advil are commonly used by patients suffering from a herniated disc. These work by reducing inflammation which reduces the pressure surrounding the nerves in your spine. At times stronger medications may be used such as narcotics if the pain is severe. Stronger medications are typically only used on a short term basis due to the risk of addiction. Steroids – Steroids can be helpful if you are experiencing a sudden herniated disc. These are powerful medications and they work similar to other anti-inflmmatory medications but they work faster and are stronger. They will alleviate swelling which will reduce the pain your suffering from. Epidural Injections – Cortisone can be injected into the aggravating area. This will relieve the pressure on the nerves. Those are the most common steps taken to help alleviate the symptoms of a herniated disc. You would progress through those steps and if nothing has helped to alleviate the pain then surgery may become an option if it’s significantly impacting your ability to function. Good candidates for surgery would include those suffering from significant weakness or pain. If surgery becomes an option the surgeon would remove the herniated disc by freeing up space around the impacted nerve. The type of surgery performed will depend on several factors such as the size and location of the herniated disc or any other problems that may be associated. In simple cases, endoscopic or microscopic excision of the herniated disc would be the favored choice of surgeons. In more difficult cases a different type of surgery would needed which may be more invasive and require a significant amount of recovery time for the patient. Most minor injuries like this heal within several weeks. Anti-inflammatory treatments for pain associated with disc herniation, protrusion, bulge, or disc tear are generally effective. Severe herniation may not heal of their own accord and may require surgical intervention. As I experienced almost 2 weeks that I suffered with this injury. So many specialist that we've been talked about this, but there's only one that I know that he can give a reliable treatment and he is expert Bulging Disc Treatment Palos Verdes . The condition is widely referred to as a slipped disc, but this term is not medically accurate as the spinal discs are firmly attached between the vertebrae and cannot "slip".